4025 1938 Laser Hot Hits. Oldies. SINPO 44333. 6210 1750 Radio Telstar South. Radio London recordings. SINPO 44333. 6256 1918 Radio Digital. Polka. SINPO 44433. 6280 1923 Radio Mirabelle. "Knocking on Heaven's Door," ID. SINPO 44333. 6285 1927 Radio 42. Dire Straits "Walk of Life," IDs. SINPO 44333. 6307 1758 Radio Caroline Rainbow. German talk and music. SINPO 44333. 6390 1932 Radio Blauwe Panter. "Too Far Away From You," polka. SINPO 44333. 4025 1928 Laser Hot Hits. Oldies. SINPO 34333. 6205 1855 Shortwave Zero Zero. Pop, jingles. SINPO 34333. 6210U 1900 Radio Barraquda. Lively music, Telstar South underneath. SINPO 44444. 6257 1845 Radio Abu Dhabi (pres). Countty music. SINPO 55444. 6265 1840 Radio Tango Italia. Tango music. SINPO 34333. 6285 1747 Bogusman. Monochrome Set song, talk about old TV aerials. SINPO 54444. 6285 1835 The Ghoul. Talking about Radio Prague, Stereophonics. SINPO 44433. 6307 1743 Radio Caroline Int. Jingle, European music. SINPO 34333. 6323 1915 Radio Underground. The Beatles "I Feel Fine, " ID, email. SINPO 54444. 6360 1858 Radio Rode Adelaar. Move from 6405. SINPO 44333. 6380 1830 Radio Lowland. OMD "Enola Gay," SINPO 44433. 6390 1740 Radio Weg Piraat. Dance music, closing. SINPO 54444. 6390 1755 Radio Joey. Dance mx, greetings. SINPO 54444. 6405 1849 Radio Rode Adelaar. Dutch music, utility QRM. SINPO 43433. 7700 1800 FRS Holland. Paul Graham show playing offshore radio theme tunes. Also on 9300. SINPO 34333. 9300 1805 FRS Holland. Offshore radio themes. SINPO 55444. 13600 1934 Radio Spaceshuttle via Bulgaria. Greeting listeners, Finnish rock n roll. SINPO 55555. 4025 1803 Laser Hot Hits. Oldies, high noise level. SINPO 24232. 6210 1847 Radio Telstar South. Oldies. SINPO 44433. *6265 1810 Radio Desperado. Madonna "Like A Virgin," SINPO 34333. *6285 1819 Radio Python. Talking about closure of 747 kHz Dutch station. SINPO 34333. 6307 1755 Radio Goofy. Dance music, jingles. SINPO 34333. 6322 1830 Radio Pandora. Stevie Wonder "Happy Birthday," SINPO 34333.
watts. Test broadcasts consist of non stop music and station identification announcements in Italian, English, Spanish and Catalan. 4025 1916 Laser Hot Hits. "Here Comes the Wolfman," then Squeeze. SINPO 33333. 6325 1900 Unid. Non-stop instrumental music, off without ID. SINPO 34333. Pirate radio is still going strong despite the rise of internet radio. For some, it seems, the FM frequency retains an allure strong enough to see them break the law. For Newsnight, Dan Freedman has been tuning in. 6238.5 1722 Radio Digital. Instrumental music. SINPO 44433. 6245 1752 Radio AC DC. Oldies. SINPO 24332. 6285 1717 Hitmix Radio. Schlager. SINPO 44433. 3900 2015 Radio Batavia. Mike Oldfield "Moonlight Shadow." SINPO 34333. 4025 2001 Laser Hot Hits. Michael Jackson "Farewell My Summer Love," SINPO 43333. 6210 2052 Shortwave Zero Zero. Pop, jingle IDs. SINPO 34333. 6262 1937 Radio Abu Dhabi. Dutch songs. SINPO 55544. 6305 1930 Radio Python. Alternative music. SINPO 54444. 6305 2025 Radio 42. IDs, Blondie "Call Me." SINPO 44333. 6400 1950 Straightline Radio. BTO "You Aint Seen Nothing Yet," electronic voice. SINPO 34333. 6751 2009 Radio GSV. Instrumental jazzy music, fair peaks. SINPO 24332. 6875 1956 Radio Europe. Disco, Italian music. SINPO 44433. This message comes to you from Marconi Radio International (MRI) which, after an absence of more than 15 years, returned to the air on 15th August 2015. Although the signal was weak, the first three test broadcasts have been already heard in Bulgaria, Germany, Scotland and The Netherlands. 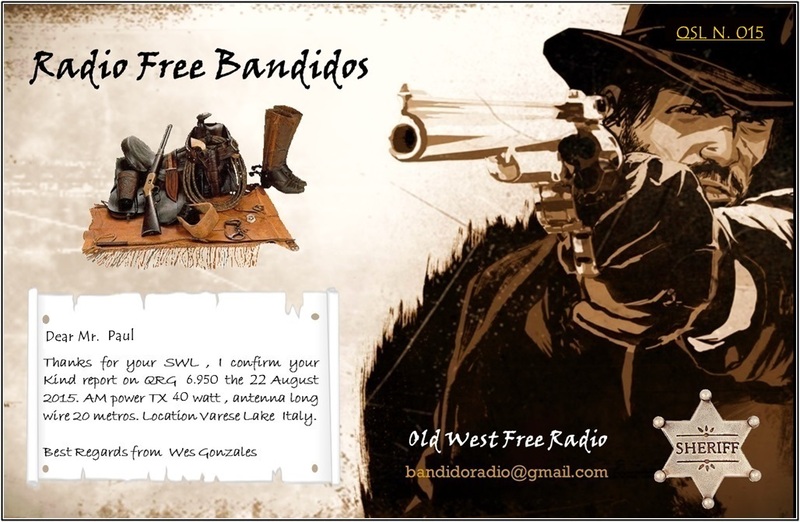 Great QSL received from Italian station Radio Bandido. Many thanks! 3930 2037 Radio Rainbow. Terence Trent D'Arby "Sign Your Name." SINPO 34333. 4025 1849 Laser Hot Hits. Gary Drew show. Fat Larrys Band "Zoom." SINPO 34333. 6210 1833 Radio Telstar South. Sixties music. SINPO 24332. 6245 1838 Radio Tango Italia. Tango music. SINPO 34333. 6261 1843 Radio Marabu. Alternative rock. SINPO 34333. 6380 1827 Radio Akenzo. Dutch music. SINPO 24332. 4025 1803 Laser Hot Hits. Madness "It Must be Love," SINPO 34333. 6211 2040 Transatlantic Broadcast. AC DC "Whole Lotta Rosie." SINPO 34333. 6261 1722 Radio Marabu. Alternative rock, German talk. SINPO 44333. 6268 2001 Radio Mustang. Country music. SINPO 55444. 6285 1750 Hitmix Radio. Falco "Rock Me Amadeus." SINPO 44333. 6305 2014 Radio Technical Man. Electro music. SINPO 44333. 6307 1745 Radio Goofy. ID jingles, dance music. SINPO 34333. 6381 2006 Radio Etherfreak. Oldies. SINPO 24332. 6385 1710 Radio Road Pirate (Weg Piraat). Stranglers "Skin Deep." ID. SINPO 54444. 6400 1730 Straightline Radio. Oldies, IDs. SINPO 33333. 6423 1954 Studio 52. Oldies. SINPO 44433. 6470 1949 Radio Carrierwave. Thompson Twins "Doctor Doctor." SINPO 34333. 6950 1942 Radio Bandido. Country rock. SINPO 54444. 6256 1730 Radio Digital. "I Heard It through the Grapevine," strong peaks. SINPO 44433. 6290 1723 Radio Goofy. Dance music, ID jingleds. SINPO 44433. 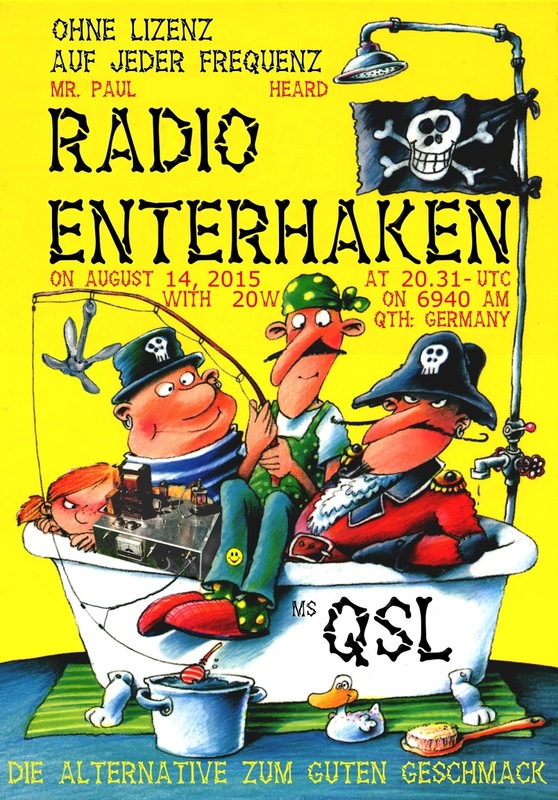 Very nice QSL received from German pirate Radio Enterhaken. In the email Captain Cook says Enterhaken is German for "grappling hook." Thanks for the QSL. 6325 1758 Radio Zwarte Panter. Dutch music. SINPO 44433. 6385 1753 Zender Akenzo. Dutch music, greetings, strong peaks. SINPO 44444. 3905 1813 Radio Alice. Dutch songs. SINPO 34333. 4025 1819 Laser Hot Hits. Soul music. SINPO 34333. 6206 1805 Radio Onda Caliente. Weak signal. SINPO 24332. 6237 1938 Radio Digital. Zombies "She's Not There." SINPO 33333. 6254 1729 Radio Marabu. German rock, GM talk. SINPO 44333. 6280 1743 Celtic Music Radio via unid relay. Folk music, legal Scottish station. SINPO 54444. 6401 1930 Radio GSV. Rock music. SINPO 24332. We proudly transmit best ever music on 13.6 MHz (13600 kHz) this Sunday 16th of August 2015 19-20 hours UTC. Please join with! 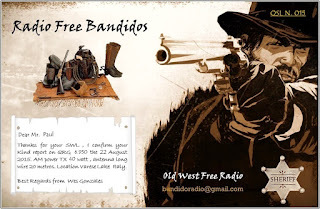 We have started to send QSL's for every e-mail reports. Started today and it will last at least to end of September (because so huge amount of reports came. Please wait with pation- no need to remail your reports now- because we have received them all! Results of Radio Spaceshuttle contest will be announced on radio waves in our last SW-transmission this month, 30th of August 2015. And prizes and printed QSLs will be sent during first weeks of October! Sorry for great delay, but we have actually not received last reports got to our Herten Box 2702 during our contest time (January-June). So we had to wait that every reports will be with in the lottery and when counting amount of reports everyone has sent to us! 4025 2133 Laser Hot Hits. "I Want to be With You Everywhere." SINPO 34333. 6254 1725 Radio Marabu. Soft rock. SINPO 44433. 6290 1827 Misti Radio. Oldies, fair peaks. SINPO 24332. 6305 1731 Radio Norton. Dutch songs. SINPO 34333. 6360 2142 Radio Altrex. Oldies. SINPO 24332. 6927L 2125 Over 60 Degree Radio. Relay of Artem's World of Music. SINPO 34333. 4025 2051 Laser Hot Hits. Genesis "Abacab." SINPO 34333. 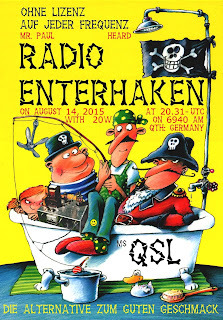 6235 2014 Radio Enterhaken. Talk in German, music. SINPO 23332. 6254 2020 Radio Marabu. Arabic sounding music. SINPO 44433. 6306 2023 Radio Mustang. "Venus," SINPO 55544. 6401 2046 Radio GSV. Oldies. SINPO 24332. 6875 2041 Radio Europe. Disco, talk in Italian. SINPO 44333. 6940 2029 Radio Enterhaken. Move from 6235, GM talk, offshore radio clip, U2 song. SINPO 34333. 6950 2035 Radio Enterprise. U2 "Where the Streets Have No Name." SINPO 54444. 4025 2140 Laser Hot Hits. "You'll Be Crying Over Me." SINPO 44333. 6210U 2052 Stargate Radio. Italian talk and music, SINPO 44444. 6240 2038 BNA Radio See comments. SINPO 34333. 6250 2046 Radio Mazda. "Let Your Love Flow," co-channel QRM. SINPO 42332. 6255 2048 Radio Mazda. Move from 6250. Now SINPO 44444. 6265 2043 Hitmix Radio. Polka. SINPO 44333. 6305 2135 TRX Radio. ID jingles, jazz. SINPO 54444. 6380 2020 Radio Universe. Queen, then M "Pop Music." SINPO 44333. 6385 2147 More 24. "To Love Somebody," "Everybody's Changing." SINPO 54444. 4025 1955 Laser Hot Hits. Abba "Winner Takes It All." SINPO 34333. 6070 1950 Superclan Radio v Channel 292. O'Jays. SINPO 55544. 6070 2000 Atlantic 2000 via Channel 292. Talk in French, "Love Hurts. SINPO 55544. 6262 1929 Radio Digital. Polka. SINPO 54444. 6399 1938 Radio Pioneer. Donna Summer "State of Independence." SINPO 44433. 4026 2038 Laser Hot Hits. Pet Shop Boys "Suburbia." SINPO 44333. 6262 2016 Radio Mazda. ID, greetings, BZN. SINPO 54444. 6285 2029 Radio Quadzilla. Sweet "Blockbuster," SINPO 34333. 6385 2000 Little Feat Radio. Jimmy Nail "Aint No Doubt," greetings, strong peaks. SINPO 44343. 6401 2033 Radio GSV. Oldies, occasional peaks, SSB QRM. SINPO 23332. 6470 2010 Tower Radio. OMD "So In Love." SINPO 54444. 6875 2022 Radio Europe. Jazz, strong utility QRM 6877. SINPO 42332. 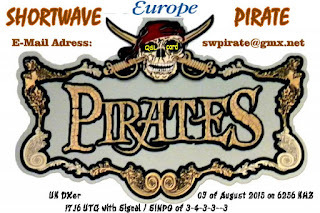 A very quick reply from Shortwave Pirate, logged yesterday on 6256 kHz. Thanks for the QSL. 3910 2000 Radio Focus Int. Sixties music, also on 6286, het from 3912 carrier. SINPO 43333. 4025 2050 Laser Hot Hits. Mike Andrews show. The Carpenters. SINPO 44333. 6200 1927 Radio Ronalisa. ID, greetings, 60s music. SINPO 54444. 6205 2055 Shortwave Gold. Disco. SINPO 34333. 6210 1931 Radio Crombi. Dexys "Gino," then "Manic Monday," close down. SINPO 54544. 6210U 1945 Stargate Radio. The Doors "People are Strange." SINPO 44444. 6255 1938 Radio Telstar South. Big L recording, "If You're Going to San Francisco." SINPO 44433. 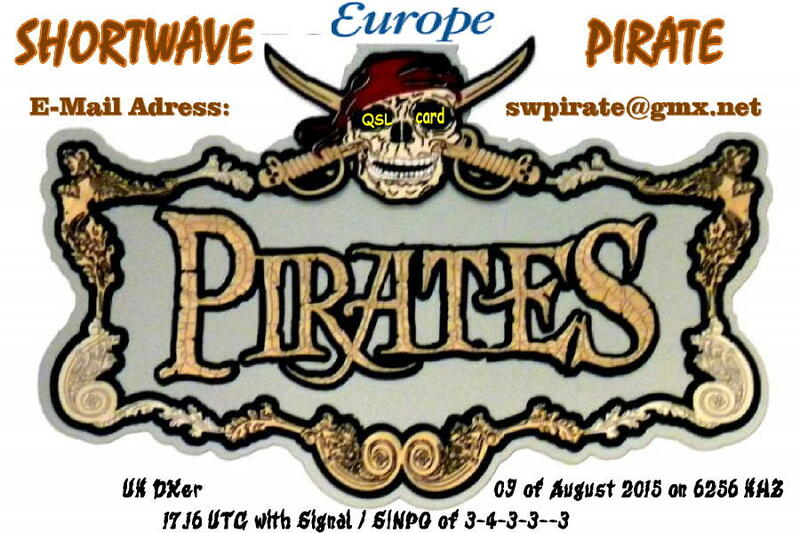 6256 1714 Shortwave Pirate. Simple Minds "Belfast Child," jingle ID and off. SINPO 34333. 6265 1750 Radio Tango Italia. Tango music. SINPO 34333. 6286 1755 Radio Focus Int. Sixties music. SINPO 54444. 6305 1722 Telstar Radio. Greetings, Sigue Sigue Sputnik, Plastic Bertrand. SINPO 54444. 6305 2005 Radio Crombi. Moved from 6210. Dexys "Come on Eileen." SINPO 55544. 6320 1950 Radio Mazda. "Venus," ID, greetings. SINPO 54444. 6325 1737 Radio Caroline Int. Chic "Le Freak", jingle. SINPO 34333. 6360 2035 Radio Altrex. Oldies. SINPO 24332. 6380 2040 Radio Anthony. ID jingles, "Goodbye Mary Lou." SINPO 44333. 6395 1718 Zender Akenzo. Dutch songs. SINPO 44433. 6399 1727 Radio Pioneer. Dutch music, splash from Akenzo. SINPO 43433. 6950 1954 Radio Enterprise. Prince "Kiss." SINPO 44433. 3905 2032 Skyline International Radio. ID, greetings, Pussycat. SINPO 54444. 3910 2022 Radio Focus Int. Jingle, 60s music, whistle from 3912. Also on 6286. SINPO 43333. 4025 2041 Laser Hot Hits. Pop. SINPO 34333. 6201 2011 Radio Sunflower. Manfred Mann "Blinded by the Light," SINPO 43433. 6210U 2015 Stargate Radio. Dance music, talk in IT. SINPO 44433. 6240 1808 Radio Caroline Rainbow. Oldies. SINPO 34333. 6262 2007 Radio Zomerzon. "Suzi Q." SINPO 24332. 6280 2027 Radio Digital. Cliff Richard & The Young Ones "Living Doll." SINPO 43433. 6286 1817 Radio Focus Int. ELO then Cream. Great signal. SINPO 54444. 6305 1813 Radio AC DC. Blues rock. SINPO 34333. 6321 1833 Radio Pandora. "Matchstick Men," Brian & Michael, new jingles. SINPO 34333. 6423 2046 Studio 52. ID, "Captain Scarlett," SINPO 24332. 3910 2200 Radio Focus Int. Rock music. Also on 6286. SINPO 44333. 4025 2205 Laser Hot Hits. Pharele Williams. SINPO 44433. 6201 2153 Radio Goofy. Pop, jingles. SINPO 34333. 6242 2149 More 24 (via relay?). Oldies, online more24.info. SINPO 34333. 6262 1828 Radio Telstar Int. ID jingle, greetings, instrumental mx. SINPO 54444. 6280 1753 Power AM. AC DC track, splash from 6286. SINPO 434333. 6286 1810 Radio Focus Int. "Cupid Draw Back Your Bow," SINPO 54444. 6307 1800 Radio Caroline Int. Pop and jingles. SINPO 44433. 6390 2133 Radio Crombi. New British station. "Yes Sir I Can Boogie." SINPO 44333. 6401 1820 Radio GSV (tent). Oldies, weak singnal. SINPO 24332. 6423 1745 Studio 52/Hitmix Radio. ID, greetings, "Captain Scarlet." SINPO 44433. 6870 2022 Radio Pioneer. Oldies. SINPO 54444. 6910 2017 Premier Radio Int. ID, greetings, Status Quo. SINPO 34333. 4025 2052 Laser Hot Hits. Stewart Ross show. Barclay James Harvest. SINPO 44433. 6210U 2045 Stargate Radio (tent). "Groove is in the Heart," SINPO 34433. 6281 2030 Radio Experience. ID, dance music. SINPO 44333. 6290 2025 Radio Rode Adelaar. Country music. SINPO 55444. 6305 2035 Radio Underground. "Walk on By," SINPO 544444. 6875 2040 Radio Europe. Talk in IT, disco. SINPO 44444. 4025 2017 Laser Hot Hits. "Licensed to Kill." SINPO 34333. 6265 2025 Radio Laguna. Erasure "Sometimes," testing new antenna. SINPO 44433. 6290 1956 Radio Mazda. ID, greetings, "Crazy on You." SINPO 54444. 6310 2000 Radio Panda. "Fast Car." SINPO 33333. 6385 1950 Radio Joey. Dutch song. SINPO 54444. 6870 2008 Radio Pioneer. Dutch songs. SINPO 54444. 4025 2016 Laser Hot Hits. Rock music. SINPO 34333. 6210U 2022 Stargate Radio. Relay of American music show. SINPO 44433. 6260 2003 Radio Panda. Blondie "Tide is High". SINPO 34333. 6267 2012 Radio 42. "Going Loco in Acapulco," SINPO 44433. 6284 1952 Radio Digital. "Eloise," "Back Home." SINPO 54444. 6380 2007 Radio Carrierwave. Thompson Twins "Doctor Doctor." SINPO 34333. 6390 1958 Radio Joey. Easy listening music. SINPO 54444. 6205 1742 Radio AC DC. Move from 6210. SINPO 33333. 6210 1738 Radio AC DC. Free "All Right Now." SINPO 34333. 6245 1801 Radio Tango Italia. Tango music. SINPO 24332. 6263 1745 Hitmix Radio (tent). Instrumental music. SINPO 44433. 6286 1754 Radio Focus Int. Drifters "Down on the Beach Tonight," SINPO 44433. 6305 1816 Radio Quadzilla. "Baby I Love You," SINPO 34333. 9301 1830 Radio Geronimo SW. ID, Black Sabbath "Paranoid," SINPO 34333. Up to 55444 by 1835. 3905 1939 Radio 555. Polka, possibly connected to Radio Alice. SINPO 44333. 3945 2045 Radio Focus Int. Rock music. SINPO 44433. 4025 2055 Laser Hot Hits. Indie rock. SINPO 34333. 6180 1858 Radio Python. Donna Summer "Living in America," strong QRM at 2000. SINPO 55544. 6200 1901 Radio Python. Moved here to avoid QRM, ID, greetings. SINPO 55544. 6240 1854 Radio Telstar. Rock n roll. SINPO 44433. 6240 2007 Radio Montferland. Abba "Dancing Queen," "Dreadlock Holiday," ID, greetings. SINPO 54444. 6255 2001 Radio Abu Dhabi. Thin Lizzy "Whisky in the Jar." SINPO 55444. 6286 1953 Radio Focus Int. Pink Floyd "Shine on You Crazy Diamond." SINPO 44433. 6304 1909 Bluestar Radio. "Voyage Voyage," SINPO 44433. 6323 2030 Radio Underground. Talking about stations heard, SINPO 54444. 6380 2049 Radio Carrierwave. Lipps Inc "Funky Town." SINPO 34333. 6390 1844 Radio Rode Adelaar. Instr mx, ID. SINPO 54444. 6400 1849 Radio Mustang. "Hungry for Your Love," SINPO 54444. 6423 2041 Studio 52. Paul Young "Love of the Common People." SINPO 44433.